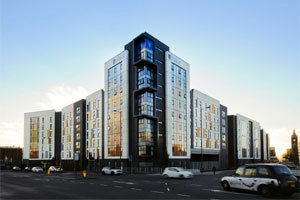 Crown Place in Liverpool is a range of striking new build residential apartments that will become ‘home from home’ to more than 1,200 students every year. The scheme is at the heart of the University of Liverpool’s campus and the three new accommodation blocks have been erected on the site of the old veterinary school at the junction of Brownlow Hill and Grove Street. The three buildings constitute the university’s ‘single largest project to date’ and have been constructed employing a concrete frame super-structure and a mixture of brickwork, glass curtain walling and GRC (glass reinforced concrete) façade elements. From the very outset the University were aware that a viable and attractive solution to the aesthetic and performance demands presented by this ambitious project could include Grade 18 GRC cladding. With this in mind, and in the very early process of designing and procuring construction support, ULCCO Special Projects Ltd asked architects Lewis and Hickey Ltd to meet with GRCA Member GB Architectural Cladding Products. They wanted to further investigate the potential of GRC cladding, with particular regards to the main white external cladding panels. The design intent also called for orange and grey feature panels to be included. During July 2013, after the tender process was complete, GB Architectural was awarded the contract to design and manufacture the GRC panels and related stainless steel restraints. 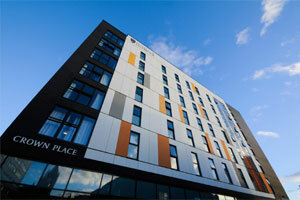 The installation period for the Crown Place student accommodation was from late October 2013 through to March 2014 which meant that the team at GB Architectural had to begin manufacturing the panels during the first week of August. Starting the manufacturing process in advance guarantees that when the installation begins there are plenty of the correct panels ready for the work to begin and no-one is waiting around for deliveries. This commitment meant that 4,000 square metres of GRC panels had to be carefully scheduled in the production process and then delivered on site in sequence and on time. The GB Architectural team view the completed Crown Place project with immense pride and conclude that: “This was a very enjoyable and rewarding project to work on, particularly as the University of Liverpool, having an open book in terms of product selection, had explored a wider variety of cladding mediums before concluding that GRC was for them.